Who could forget Iraq’s improbable triumph in the 2007 Asian Cup when, against all the odds, they defeated Saudi Arabia in the final to win their first continental trophy? It will go down as one of the great moments of not only Asian football, but world football in general. Could we see a repeat performance in 2019, when a dark horse comes bolting in from outside the pack to claim Asia’s showpiece tournament? It’s not completely outside the realms of possibility. Here, we take a look at those who are capable of causing an upset. If this article was to be written four years ago, after the Emirates’ remarkable run in Australia, then the UAE would definitely have been listed as a ‘Contender’ (more on them tomorrow). But much has changed in four years and, truth be told, the Emirates haven’t progressed as many had expected or hoped. Former Japan coach Alberto Zaccheroni was brought in after the brief reign of Edgardo Bauza following the resignation of Mahdi Ali at the start of 2017, but the Italian has really failed so far to get the squad to where it should be heading into what was meant to be their crowning glory on home soil. Making his job that much harder is the absence of arguably Asia’s best footballer: Omar Abdulrahman. The prodigiously talented midfielder captured everyone’s attention four years ago in Australia, but an ACL injury sustained while playing for Al Hilal in November ended his dream of leading his nation to glory. Pleasingly, star striker Ali Mabkhout has found his form again for Al Jazira this season, with 15 goals in 12 matches and the combination he has formed with the rising star of Emirati football, Khalfan Mubarak, is one to get mouths watering. The 23-year-old Mubarak hasn’t always imposed himself when playing for the national team, but such is his form for Al Jazira this season that he cannot be ignored – eight goals and ten assists in 13 matches is outstanding in anyone’s language. They may be coming from further back, but with the support of the home crowd and a favourable draw, if they get on a run then the quality still remains. Depending on your view of things, Syria were the darlings of world sport a little over 12 months ago when they were on the cusp of their maiden appearance at the FIFA World Cup. 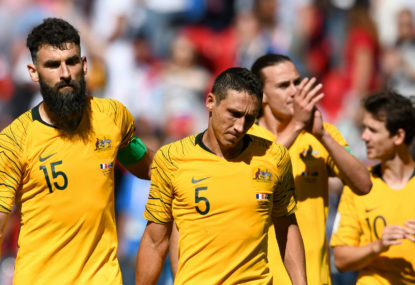 Had luck been on their side in the nailbiting playoff against Australia then it would’ve been them, and not the Socceroos, on the plane to Russia. So this is a side that has proven it can match it with Asia’s best. Wins over Uzbekistan and Qatar, and draws with South Korea and Iran, prove they are to be taken seriously. They also boast one of the most fearsome strike duos at the tournament, with Omar Khrbin, the 2017 AFC Player of the Year, and Omar Al Soma, the leading scorer in the Saudi Pro League for the last four seasons, leading their attack. However, they too have been struck by the Asian Cup injury curse, with inspirational leader Firas al-Khatib ruled out. While al-Khatib hasn’t always been a member of the squad in recent times, those with memories of the playoff against Australia will remember how dangerous he was coming off the bench in both legs. Forever the bridesmaids of Asian football, it sometimes seems that no matter how good it seems to be for the White Wolves they will somehow conspire to mess it all up. For both 2014 and especially 2018, they appeared to be in dominant positions when it came to World Cup qualifying, and on both occasions somehow fell short. The talent has never been in question, not when you have the likes of Server Djeparov and Maksim Shatskikh in your line-up. The question has always been about their mental strength and the confidence to take on Asia’s elite. This Uzbek side isn’t as good as they’ve had in the past, and some of the talent they do have coming through hasn’t reached the heights many expected. At the last Asian Cup, striker/winger Sardor Rashidov was one of the standout players and at 23 looked to have a big future ahead of him. But after mixed results when moving abroad, he is back in Uzbekistan and, now 27, it’s time for him to deliver on his promise. Igor Sergeev, another who impressed in 2015, has similarly failed to progress as expected after his ill-fated moves to China and UAE, and was left out completely by new coach Hector Cuper. The Argentine has invested in the future though by calling up five players from the U23 side that won the AFC U23 Championships in January last year, including tournament MVP Odiljon Hamrobekov. Whenever you look at Iraqi football, especially the national team, it always seems to be in a state of chaos, with players angry at the federation for any number of issues and the leadership in a general state of flux. As if to prove that point, Slovenian Srečko Katanec, appointed in September, is their sixth manager since the last Asian Cup. And yet despite the chaos, they still have a side brimming with talent and with an average age of just 24 they have one of the youngest sides at the tournament. Mohanad Ali and Hussein Ali are two of the brightest prospects coming through, but they are joined by the likes of Ayman Hussein, Humam Tariq and Bashar Resan, who was impressive for Persepolis on their run to the AFC Champions League final last year. If there is one team that comes into this Asian Cup full of confidence it is Vietnam after winning the AFF Suzuki Cup last month – just the second time in their history they have lifted the regional trophy. Vietnam is a side that has been developing nicely over the last few years and last year they showed their potential by making it to the final of the AFC U23 Championships. With an average age of just 23, this is not only a team for the now, but one for the future too, built largely around the side that made such a huge impression at the AFC U23 Championships last year. Led by Korean coach Park Hang-seo, some will argue that his tactics are too dour, especially for a side laden with so much attacking talent, but in almost 16 months in charge, he has the runs on the board – the final of the AFC U23 Championships and winning the AFF Suzuki Cup. Those who watched the recent AFF Suzuki Cup will know all about the talent of Nguyen Quang Hai, the star player in the middle of the park for the Golden Stars, while Nguyen Cong Phuong and Phan Van Duc are also ones to watch. They may be coming off a disappointing AFF Suzuki Cup campaign, at which they conceded their crown as Southeast Asia’s best team, but this Thai side has proven over the last few years that it belongs at the upper echelon of Asian football. Their failure at the AFF Suzuki Cup is put in some perspective by the fact they were missing their four best players – Chanathip Songkrasin, Teerasil Dangda, Theerathon Bunmathan and Kawin Thamsatchanan – who all missed due to club commitments in Japan and Belgium. Unfortunately for the War Elephants, Kawin will also miss the Asian Cup after failing to recover from injury in time, but the return of the three Japanese-based players will make a world of difference to Thailand, Chanathip in particular. The diminutive midfielder is coming off a career-best season in Japan with Consadole Sapporo, and was named in the J.League Team of the Season last month. Should they finish runner-up of Group A, which is entirely plausible, they will face the runner-up of Group C, likely to be China or Kyrgyz Republic, in the Round of 16 in a match they would fancy themselves to win. From there, anything is possible. 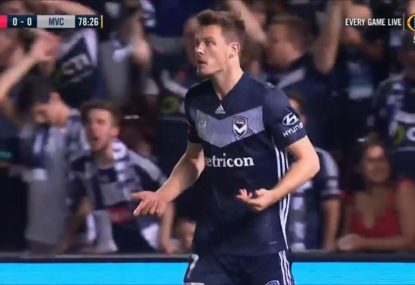 Paul Williams is an Adelaide-based football writer. Specialising in Asian football, he writes about the beautiful game for a host of publications including SBS The World Game, FourFourTwo Singapore and Al Jazeera, and is a regular guest on the Daily Football Show. 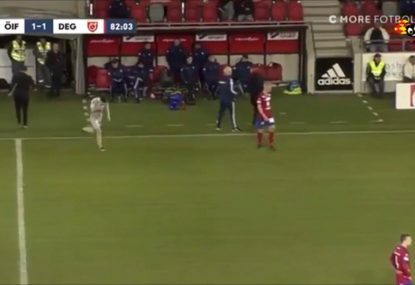 Thankfully for Mattias Ozgun he did return to the field later, but yes. This really did happen. Were the Victory wrongly denied a crucial late goal? This could have won them the game! 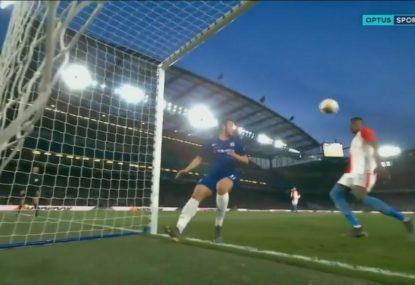 There wasn’t really much Simon Deli could do to prevent doubling Chelsea’s lead in the Europa League quarterfinals. 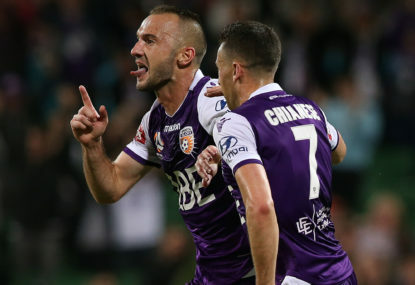 Are Perth Glory the best team in Australia by virtue of losing 1-0 to Sydney FC at Jubilee Stadium in Kogarah overnight? 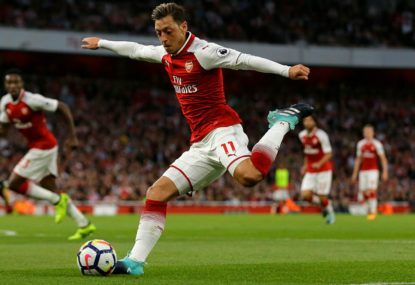 London rivals Arsenal and Chelsea have celebrated quarter-final victories to move within two matches of a possible Europa League derby final. 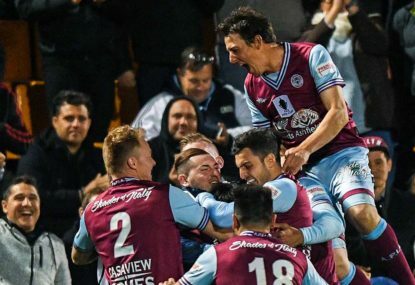 Should A-League clubs be worried about the second tier in Australian football? Maybe they should be.